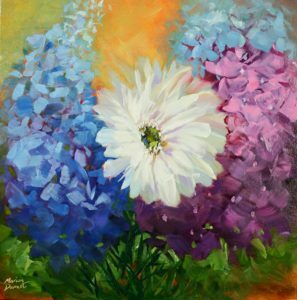 For the last 3 months I have been working solely in oils. Will I return to pastels? Yes, certainly, for I love working in pastel, but I do find the fact that they have to be framed behind glass rather a nuisance. I am enjoying using a paint brush, though I find fine detail harder with the brush than with a pastel stick. In some ways that is a good thing as it has allowed me to loosen up. 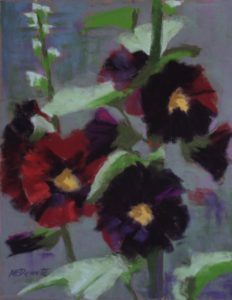 I have still been working mostly with florals, and have taken another Nancy Medina brilliant colour course. 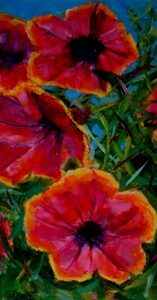 I have always loved working with bright colours, and flowers allow me to push the colour to extremes. 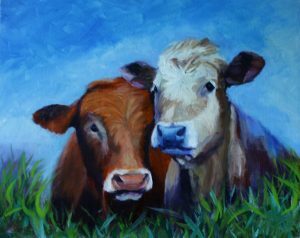 I continued working on the painting “Cow Pals” that was in my last blog, and this is the result. 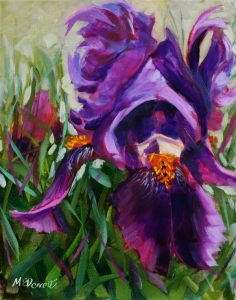 I recently applied to and was accepted as an artist by the online art gallery Artfinder.com. This has allowed me to put my work up for sale online – easily done from the comfort of my computer. 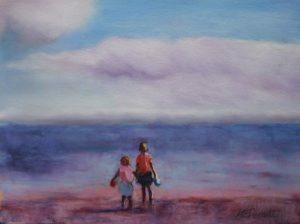 As yet I have only sold one unframed pastel, but at least it is a venue that allows for unframed work to be put on sale. It is early days, and I hope for more sales in the future. 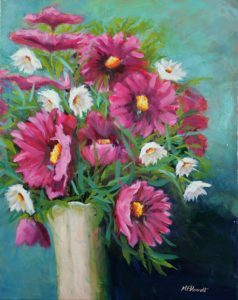 I still have work hanging in Green & Jenks in Monmouth, and recently sold a floral pastel painting there. 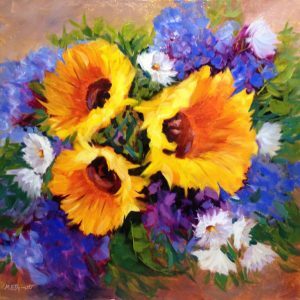 I have also been making an effort to use more social media to promote my work, and now have a new Facebook page for my art. 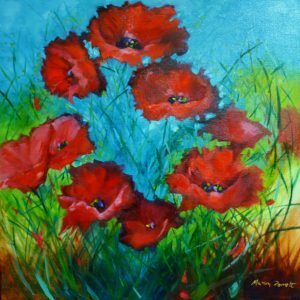 It is called “Marion Derrett Art”, and I would appreciate anyone, who hasn’t already done so, to like and follow this page. I have also started using Twitter and Instagram for promotion, so can be found on all these sites.